Heat the oven to 400°F. Line a baking sheet with parchment paper. Sprinkle the flour on the work surface. Unfold the pastry sheet on the work surface. Roll the pastry sheet into a 10x16-inch rectangle. Place the pastry sheet on the baking sheet. Using a sharp knife, score a 1-inch border around the edge of the pastry sheet. Sprinkle the cheeses and oregano on the pastry to the border. Arrange the pepperoni on the pastry to the border, making 3 rows, with 5 slices in each row. Bake for 20 minutes or until the pastry is golden brown. Beat the oil, lemon juice, parsley, salt and black pepper in a medium bowl with a fork or whisk. Add the arugula and toss to coat. 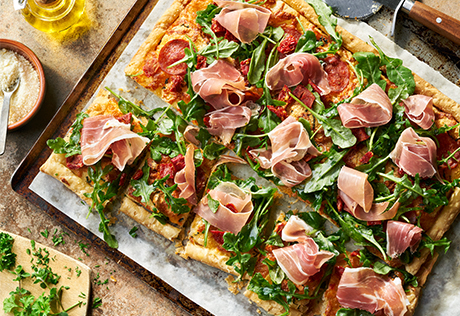 Top the pastry with the prosciutto, tomatoes and arugula mixture. Cut the pastry into 18 pieces. Time-Saving: To save prep time, omit the oil, lemon juice, parsley, salt and black pepper and substitute 2 tablespoons of your favorite Italian salad dressing.